Years ago when I first got saved, I attended a small church of less than 100. We didn’t have a worship band. In fact, all we had was a CD player and a bunch of CDs for our worship. I had been born again for probably less than a year when the youth pastor gave me the responsibility to choose the songs for one of the services. I decide to choose the Old Rugged Cross, which many people might think was a good idea. But the version I chose wasn’t something that your grandma would appreciate. I chose a version by the band The Insyderz, which was more of a punk/ska version. I enjoyed the song, but just because I enjoyed it doesn’t mean it fit in the service. We sang this song. But afterwards I had a nice talking to with the youth pastor. While he appreciated my love of God and desire to help out, he didn’t think such a song was appropriate for the worship service that everyone was attending. Shortly after the conversation, I was in 100% agreement with him. Today, after years of maturing, there would be no way that I would let my younger self play that song during a service of that type. Now that may be great for youth service or for the music played before a youth service (note the term youth), but not for the main service of almost any church. After growing in the Lord, learning how to be led by the Spirit, it’s an easy decision. It’s easy to tell the difference between my opinion and the Lord’s plan. It’s the Lord’s plan that everybody enter into His presence, and with a song that is geared more towards a specific group – that’s a whole lot harder. That’s something I just didn’t understand back then. It’s easy to know the difference between your opinion and the Lord’s plan when you know how to be led by the Spirit, when you know the Lord’s voice, and you follow that voice. It’s also easy when you don’t have a preconceived idea of what should happen. I believe too often, we as Christians, even as ministers, have a preconceived idea of what should happen. We have a preconceived idea of what should be spoken. For ministers it’s easy to say that we should preach on a certain subject at a certain time. We speak about the cross at Easter, the birth of Jesus at Christmas, about mothers and fathers on Mother’s Day and Father’s Day, about what to do with what you got from God after certain event. But what if God wants to do something different? 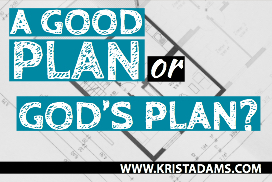 Our preconceived ideas, plans, and opinions push out God’s plan. I know of a certain minister who had written a beautiful sermon for Mother’s Day, and the Lord told him that he wasn’t supposed to preach that sermon on Mother’s Day He spent hours and hours preparing the sermon, with scriptures and quotes from famous people, on how beautiful mother was. And the Lord told him not to preach that sermon, but to have a healing service. He argued with the Lord for a little bit, but after a few moments preaching his sermon, he switched over and followed God. Now one of his arguments was that people were there at church to hear about mother, and that’s several of those people would never come to church again and this was the only time to get them saved. This was the perfect time to do it when talking about their mother because the sermon had all the things that would tug at the heart and was just so good. It ended up that several people got healed, and some even got saved. Many of those that got healed/saved were heads of the families and as such, there were several families added to the church. Not only did people get saved, but they got healed, and the church grew. That wouldn’t have happened if the preacher would’ve gone along with his own plans, and his own opinion. When we follow our own plans and opinions, it’s a coin flip of what will happen. But when we follow the Lord’s plan – He will bless them. I remember sitting in church one night when the associate pastor of this church stood up to preach. At this church, it was almost a coin flip of knowing which pastor would be speaking at the Sunday night service.There were several associate pastors, so there was a lot to choose from. You never knew who it was going to be. But as worship concluded, this certain associate pastor stood up and took the pulpit and immediately I had the thought in my mind of wondering if anyone would notice if I got up and left. I had a preconceived notion about this pastor. A lot of people did. He had the tendency to ramble, just get off subject easy, and many times ended up just being boring. But as I sat there, I paused, shut those thoughts up and let the Lord to speak to me. And He corrected my thinking. By coming to church with that preconceived idea, I was going to stop what God wanted to say to me through that Pastor. We do that often times I believe. We believe that because the pastor is going to speak on a certain subject, we already know everything about it. Or there’s a certain preacher that’s going to talk, and we shut our ears and our hearts off. We need to understand that in the natural, it may be that preacher or that sermon topic, but if we would allow the Holy Spirit to speak to us through that preacher or through that message, we could receive so much more than that message or that preacher could ever say. That has happened to me many times in church. It is a regular occurrence. The reason the Lord can only bless people as ‘far as he can’ is because the Lord would be putting his stamp of approval on what people were doing and on their plans and that would be saying that it was His plans, and His will, when it was not. He said he blessed them as much as He could, but that the plans of men could not get the Lord’s full blessing. Do you think people get saved by doing their own works? Do they get save by believing in an elephant? Do they get saved because somehow they got good enough? No! People get saved because they follow the plan of God. Do you believe that people receive from God by going to a church and giving money? No! They receive answers to prayer because they follow the Word of God and what it says. We are blessed when we follow the plans of God, not our own plans. Jesus Himself said He only said and did what He saw his father do. Even Jesus didn’t do and preach what He wanted to. He did what His father wanted Him to. One of the reasons that happened is because Jesus spent time in prayer getting direction in the plan of God for His life. As ministers, those with an opportunity to preach the Word, we can oftentimes jump to conclusions about what we are to preach. Should you preach about mother on Mother’s Day or follow what told you in prayer? Of course, that also means that we can’t allow all the wisdom that we have obtained to dictate what we should say or do. We should allow God to lead us on what we should do with that wisdom. For Christians, we really should take time to pray before church. What? Pray before church? Yes. We should come to church prepared to receive from God. We shouldn’t wait until we get there to get ready. By the time we get to the point of being able to receive from God clearly, service is almost over. And we should always come to God with no preconceived ideas. Yes – God wants to save people, heal people, touch their lives. God wants to do wonders in people’s lives. But it’s up to Him how He does it. It’s up to us to find that plan and get hooked up with it. Remember, just because it seems like a good thing, that doesn’t mean it is. The Apostle Paul, Timothy, and Silas went out preaching and you would think that just going out to preach would be fine. Go into all the world and preach the Gospel. Yet the Holy Spirit forbade them from going to Asia to preach the Gospel (Acts 16:6). It may seem like a good idea, and even thoroughly scriptural, but we need to learn to be led by the Holy Spirit so when that moment comes that God says go, we can go. And when that moment comes that He says stop, we’ll stop as well. Stay with the Word and the Spirit.